Brown Butter Chocolate Chip Cookies with dark brown sugar, two types of chocolate chips and a sprinkle of sea salt. These are, in fact, the BEST cookies you will ever eat. Let’s flash back to around 2012 when I was off trying to perfect the absolute best chocolate chip cookie. I was living in Washington D.C. at the time and my entire world outside of work included baking my heart out. It took me months and months to find an accurate and delicious ratio between butter (it had to be browned), brown sugar (a higher ration than white sugar) and of course, chocolate (two types of chips!). I was sick of making homemade chocolate chip cookies that were overly crispy and flat, like the Tollhouse version that’s boring as hell. What I wanted was a chewy, delectable, melt-in-your-mouth center that sent me to heaven in just one bite. However, I also desired a slightly crispy edge that would hold together well upon dunking into a big glass of milk. You feel me? Cookie perfection ain’t easy! 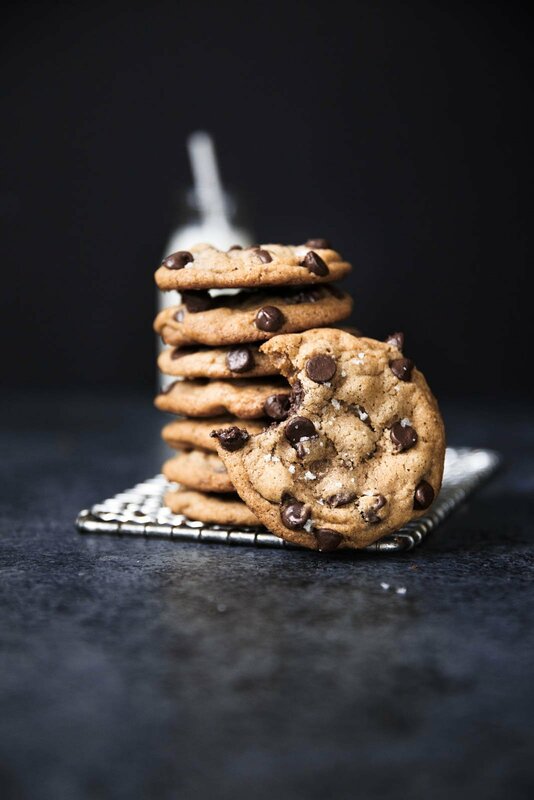 Well it’s been over four years since I created these brown butter chocolate chip cookies, and I figured that some new photos were due on the blog (with the addition of a reminder to bake these cookies as soon as you can!). They are my favorite. And heck, who cares if they aren’t healthy. What they are is a special treat you can feel good about baking. And so finally, here we are. 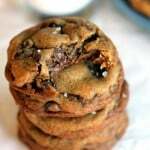 The Best Brown Butter Chocolate Chip Cookies You’ll EVER eat! The brown butter is what really makes them so unique. The flavor profile is nutty, sweet, toasty and reminiscent of a caramel hazelnut flavor. If you aren’t sure how to brown butter, you can refer to my tutorial here. Like I said, it’s a love story. Why else are these cookies so damn dank? The high DARK brown sugar ratio! Instead of doing a half and half ratio of regular granulated white sugar and brown sugar, I do mostly brown sugar. The brown sugar helps to keep the cookies softer and chewier in the middle, yet still allows for crispy, delicious edges. 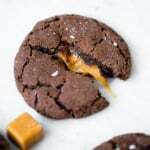 Normally I choose dark brown sugar because it has a tiny bit more molasses in the flavoring, which again, helps to achieve an out of this world cookie. The addition of greek yogurt! A tablespoon is all you need to 1) help activate the baking soda so you get amazing crinkly-looking tops and 2) keep the dough moist and lovely. Don’t you forget it. Two types of chocolate chips! One milk and one semi-sweet. It really just creates more flavor profiles. Chilled dough! Yes, this recipe requires you to chill the dough, but I promise it’s worth it. Chilling cookie dough allows the cookies to create a smooth caramel flavor, with crispy brown edges and a chewy interior. This happens because the fat in the recipe (butter) is solid and the sugar also absorbs some of it. Trust me! These cookies are freezer friendly. Just roll into dough balls and place in freezer-safe container for baking later. Once you’re ready to enjoy, take out the dough ball and bake as directed. You may need to add another minute or two to the baking time. Freezing cookie dough is wonderful because it allows for portion control or simply for prepping ahead when you have guests or are throwing a party! These cookies aren’t just epic, but also life-changing. Several of my friends have baked them time and time again, only to tell me that they’ll never make another chocolate chip cookie recipe simply because this one is the best. 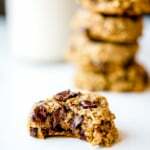 If you look back through the old post, you’ll see that these cookies receive rave reviews. So basically what I’m saying is that I know you’ll love my go-to chocolate chip cookie too. I hope you enjoy these brown butter chocolate chip cookies as much as I love baking them. If you make them tag me on Instagram with #ambitiouskitchen so I can see your creation! 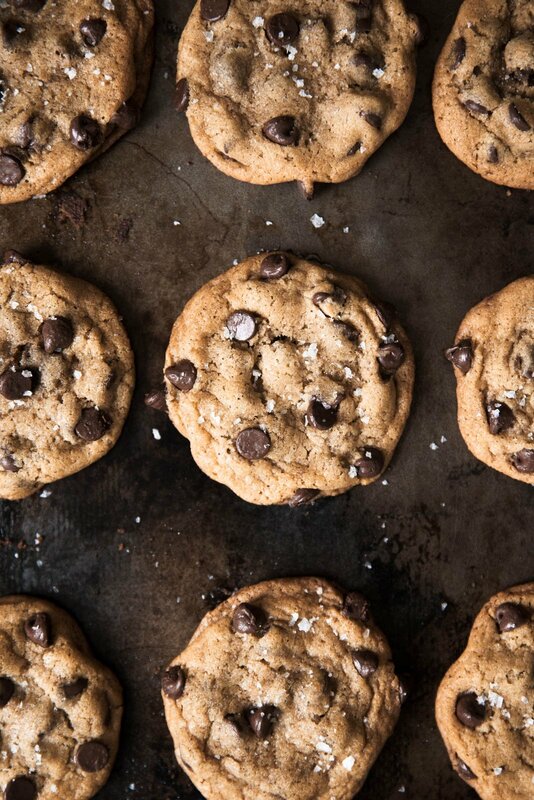 The Best Brown Butter Chocolate Chip Cookies You'll Ever Eat. These are my go-to cookie -- every time I make them people go back for seconds and ALWAYS ask for the recipe! They are the best cookies ever!! Whisk together the flour, baking soda, and salt in a bowl and set aside. Melt butter in a saucepan over medium heat. The butter will begin to foam. Make sure you whisk consistently during this process. After a couple of minutes, the butter will begin to brown on the bottom of the saucepan. Continue to whisk and remove from heat as soon as the butter begins to brown and give off a nutty aroma. Immediately transfer the butter to a bowl to prevent burning. Set aside to cool for 5-10 minutes or until cool enough to touch. With an electric mixer, mix the brown butter and sugars until well combined, about 1 minute. Beat in the egg, egg yolk, vanilla, and yogurt until combined. Add the dry ingredients slowly and beat on low-speed just until combined. Fold in the chocolate chips. Chill your dough for 2-3 hours in the refrigerator, or up to 12-24 hours. Do not try to speed up this process. The dough needs to chill! Once dough is chilled, preheat the oven to 350 degrees F. You might need to take out the dough and thaw it out a bit before measuring the dough if it is super hard. This should take about 20 minutes. Once ready to bake, measure 2 heaping tablespoons of the dough or use a medium cookie scoop. It doesn't have to be perfectly rolled. Place dough balls on cookie sheet, 2 inches apart. Bake the cookies 9-11 minutes or until the edges of the cookies begin to turn golden brown. They will look a bit underdone in the middle, but will continue to cook once out of the oven! Cool the cookies on the sheets for 5 minutes to allow them to set up, then sprinkle each cookie with sea salt. Remove the cooled cookies from the baking sheets and transfer to a wire rack to cool completely. Makes 24-36 cookies. 141 Responses to "The Best Brown Butter Chocolate Chip Cookies You’ll Ever Eat"
When you say they’re the best you’ll ever eat, I believe you!!! 🙂 So pumped to make these this weekend. I’ve always been intimidated by browning butter, but this time I’m going to do it right! These look so freaking yummy! Hey now, anytime some says “the best” I always have to try them. Definitely adding these to my list of recipes to try! YES you will 100% win with these! I have been making these cookies since you have posted them four years ago. They are the best chocolate chip cookie recipe I have ever made. I’ve tried different ones and I always come back to this one. My friends call them crack cookies and are blown away by their flavor profile. I have perfected these cookies so a few of my tips in case it helps other readers. Let your brown butter come to room temp and solidify again, this creates a fluffier cookie. I add 1/8 to 1/4 tsp cornstarch which also will thicken them up a bit. 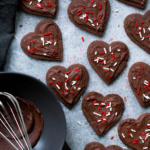 (Sometimes they can be just a tad greasy and flat so I have found this helps), I use semi sweet and dark chocolate and when I am feeling generous I will hand chop the chocolate and it melts beautifully. Mine take about 10 1/2 mins and they won’t look done, but they set up more as they cool. It’s a tricky game there because I have taken them out to soon and even after cooking they’re under done but too long and it’s ruined. Again about 10 to 10 1/2 mins. These cookies are best the first day so I have found if you pop them in the microwave for 10-15 seconds they’re perfect again the next day. They also dress beautifully. I only add sea salt on the tops after baking, I don’t add it to the tops before as well. Ok I think these are all my tips, like I said they are there only cookie recipe you will ever need and they blow every other cookie out of the water. Thanks Monique for creating this!! Love your tips! Yes to about 10 minutes. They look underdone, but they won’t be once they sit on the cookie sheet for about 5 minutes they are perfect. Thanks for being an AK reader for four years — means the world to me!!! Agreed, ladies! Only rookies bake their cookies until they are uniformly brown. 😉 Slightly browned on the edges and raw in the center is the way to GO! Trying this recipe now. Thanks! Ok I totally meant they freeze beautifully not dress! Autocorrect…. I can’t wait to make these!! Question for you – I make ghee all the time so I’m very familiar with the phases the butter goes through as you cook it. 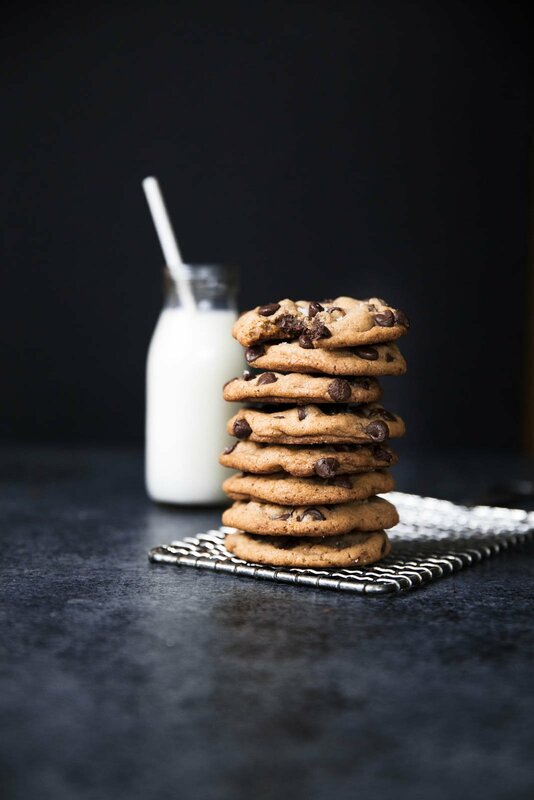 Before you use your brown butter, do you strain out the almost burnt milk solids, or do you put it all into the cookies? These are my absolute favorite chocolate chip cookies!! Everyone should make these!! I have adopted these as my ‘signature’ cookies. I send them to family on the holidays, bring them to work to brighten a co-worker’s day and even used them to get to know my noisy upstairs neighbors. They’re much quieter now and it’s definitely the cookies that did it. 🙂 Thank you! Anytime I make chocolate chip cookies it’s always this one or of course the nutella stuffed chocolate chip cookies! Thanks for all the fabulous recipes. I’ve made quite a few and keep coming back for more. Just a question – is your measurement for “a couple of tablespoons” correct? My first batch have turned out to be absolutely enormous & have joined together. Was it a typo? Delicious either way, so no drama. I just tried these and they’re definitely the best cookies I have ever tasted! Thanks for the great recipe!! Love making this recipe. Have you ever tried adding walnuts to this recipe? Would you change anything, or just add the desired amount of nuts? Thanks! This is definitely the best cookie recipe in the world. I am baking now to ship to family in Oregon and Illinois. I scoop the dough into balls and put onto parchment-lined rimmed baking pan and freeze, then drop the frozen balls into ziploc bags for storage in the freezer. It saves the chill/warm-up phase. Thank you so much for creating these amazing cookies, which are also known as Crack Cookies in my house. Hi Monique. I also have used this recipe since 2012 and it is LOVED by all recipients! Is it my imagination or did the amount of baking soda change from 1.5 tsp to 1 tsp? I had printed the recipe from 2012 and it did have 1.5 tsp as the amount. Believe, folks, these are the BOMB. Best chocolate chip cookies ever. Bested only by, perhaps, the nutella-stuffed ones on this site. Every time I make these people go crazy and want to know what makes them taste so good (it’s the brown butter!). Make them and enjoy! Actually is it to replace the water lost when browning the butter? Sorry that’s the addition of yogurt that I’m curious about. Is it added to replace the water lost in the browning of the butter? No it’s meant to keep the cookies soft and react to the baking soda nicely. is there any way I can make these without an electric mixer?? I’ve made this recipe over and over again, and I always get tons of compliments and demands for the recipe. This cookie truly is the best chocolate chip cookie ever. You’ll never need another chocolate chip cookie recipe again. If you scoop the dough, then chill, you won’t have to deal with concrete dough later. This recipe is delicious! People love them, and I like to keep some dough ready in the freezer, ready for cookie craving emergencies. You may want to change “Why else are these cookies so damn dank” to “Why else are these cookies so damn dark.” Nobody wants to make dank cookies. These cookies are my go-to and everyone always demands the recipe. 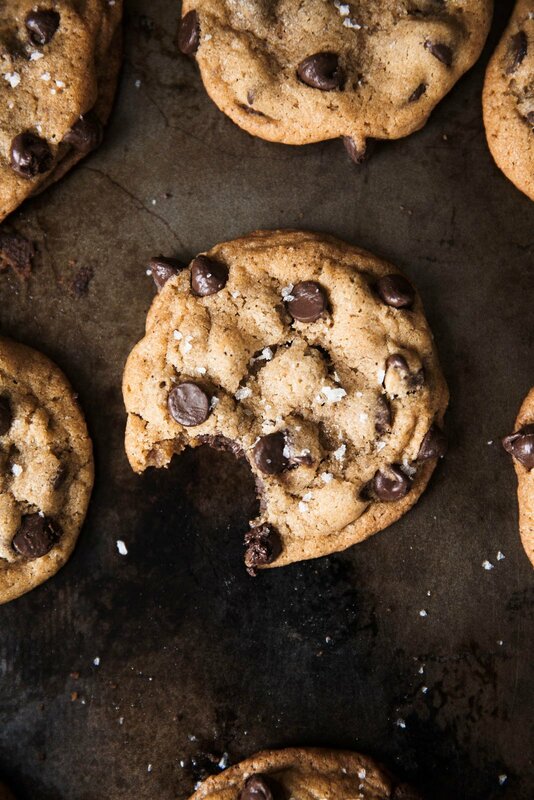 Honestly, you’ll never need another chocolate chip cookie recipe ever again. Probably the best cookies in the universe. One thing I don’t usually have on hand though is the greek yogurt. Can other yogurt be substituted? Vanilla greek? Plain regular? Vanilla non-fat regular yogurt? Whole milk yogurt? Yes, basically any yogurt will work 🙂 I would do greek though to keep the consistency the same! oh em gee!!! I’m in the chilling the dough phase, but I tasted it and it is ahh-mazing. I could just eat straight dough all day long. My patience is being tried. I forgot to buy more chocolate chips so I put in half chocolate and half caramel bits. I have a feeling it is going to be awesome. The brown butter is to die for… Nice Job Monique! Caramel bits…YUM! Hope you loved these! Okay, Monique, Paleo be damned! Can you use sour cream instead of yogurt? My search for the perfect chocolate chip cookie has ended…thank you! These are out of this world. The only change I made was to add an extra 1/4 C of flour and I baked them for 12 minutes. Hubby likes his cookies a little more done and they were perfect! Crisp on the outside and still soft on the inside and they baked up so nice and high. May I share them on my blog and link back to you? You are about to make a lot of cowboys very happy when I stash these in their trucks when we wean cattle this fall. Yay! So great to hear. Feel free to share a photo and link back to the recipe here 🙂 I hope they all enjoy them! Hello! Can’t wait to try these cookies 🙂 any suggestions on cutting out some of the sugar? Hi Selena! I’ve actually only made these this way (they’re my more indulgent cookies you’ll find on the blog 🙂 ). I have a bunch of other cookies & treats with alternative sugar options though, too! This is a winner! I have made so many chocolate chip cookies and yes, as promised, these are the best! I used to love the mix of Crisco and butter but didn’t love using Crisco. Now these cookies have all of the texture that Crisco delivered but taste so much better! I never would have thought of adding greek yogurt. I only had vanilla flavored greek yogurt, I imagine it just added some sweetness but it all worked out wonderfully 🙂 Now i just need to remember to pick up dark brown sugar (I used light) at the store for next time! Thank you for the fabulous recipe, I can’t wait to try others from your blog! Hi! It should be around 270 grams. I sometimes use that method, otherwise I just use a spoon to level it! My 7 year old is a chocolate chip cookie freak and it’s her birthday party on Saturday. Wondering if you’ve ever tried baking this dough in a pizza pan or as bars — kind of a chocolate chip cookie cake? If you have, what size pan/how much baking time? Thanks. If I were to double the recipe, would you use 2 whole eggs and 2 egg yolks, or would 3 eggs work? I would do 2 whole eggs and 2 egg yolks to maintain consistency! Hi Monique! I never comment on these blogs but had to make an exception for the best cookies I have ever eaten in my life. This is my go-to potluck recipe! The best part is how easy it is to make on a whim (no need to wait for butter to soften!) The Greek yogurt is also a game-changer, it inspired me to look up how baking ingredients affect the cookie since I wondered why that tablespoon was so important. Thank you Monique!!! Monique!! Please PLEASE consider a grain free version of this cookie!! I would love you forever. You’re the best! Could you section the dough out into cookie sized balls before freezing them? That way you could pop them out of the freezer and into the oven without waiting for the dough to thaw? I’m really having a hard time with this recipe. I do love the flavor and the texture, but my cookie is turning too flat, I even refrigerate them 24 hours. I’m from ecuador, so I do not know if the ingredients have anything to do this problem. Hi Maria! It could be a difference in ingredients and/or oven baking time. I would maybe try and make “taller” cookie dough balls when you put them on the baking sheet and see if that helps! These cookies are amazing. I added toffee bits and chopped toasted pecans to mine. Also used dark chocolate chips Gives them a few more layers of flavor! I also learned to not overback them. My first pan was actually perfect, though I thought they were ovedone. I baked each subsequent pan a bit more and they were overdone. Don’t be afraid. Let them be and you will have the most amazing finished product!! Toffee bits + toasted pecans sounds amazing in here! And yes – I find that slightly underbaked makes them perfect 🙂 So happy you enjoyed! I made these with Gluten Free Pillsbury All Purpose flour and they were wonderful. I thank you for sharing! SO happy to hear that! These are my favorite for a reason 🙂 Glad you found a new go-to, and virtual hug right back! I’m curious to know if anyone has baked these at high altitude? I live over 6,000 feet and that often makes cookies totally flat – especially when using all butter. I’d appreciate any suggestions! I haven’t done it, but found this article that might be helpful! now? or should it be tossed? Since i mixed the dough it hasn’t sat on the counter at all. Thanks! I think it should still be fine, but always feel free to freeze it, too! I enjoyed these cookies flavour, but my cookie balls never really flattened in the oven for some reason, so I ended up with more like cookie cakes. Any suggestions what might be the cause, I refrigerated 2 hours and baked. Interesting! I would double check your ingredient ratios and be sure everything is correct. You can also gently flatten them with your hands before baking! These are “the best” chocolate chip cookies I have ever eaten. So good! Gah! Stop me from eating too many. My husband just ate 3. Said nothing the entire time, just mmmmmmmmmm over and over. Aren’t they incredible?! They’re my best-ever for a reason! 🙂 Glad you both loved them. can you use salted butter instead of unsalted? Sure! Note that you might want to reduce the salt in the recipe. If I wanted to make these dairy free would you suggest using coconut oil or butter in lieu of the real butter and the yogurt??? I’d recommend using a vegan butter and just leaving the yogurt out! HI, I am wondering how you measure your flour for these recipes. Is it fluffed up and scooped out with spoon or can I just dig in the flour with my measuring cups and scoop out? Thanks. Monique, you have a winner here. These are the best cookies I’ve ever made. The scent of the brown butter alone was delicious. I even cut the sugar to 2/3 of a cup, and it still tasted wonderful. Thank you for this recipe! 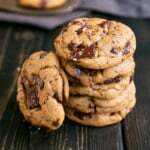 This was the best chocolate chip cookie recipe I have ever made! Everyone LOVED these cookies when I made them and said that this was the best cookie they ever ate. Thanks for the recipe — I will definitely keep this one and make it again! What’s the shelf life of this recipe? Thanks! I’d say about 2-3 days, or you can freeze them for a few months! Could you provide macros for these cookies? Can I make the browned butter the day before and then take out of fridge and bring to room temperature before I mix? I made these cookies today. They are really good. The only thing I did differently was to omit the white sugar; I thought the cookies would be too sweet. I’m glad I did. Also, I think the next time I make these, I will use a non-stick pan to brown the butter. Some of the brown bits stuck to my stainless steel pot. Thank you for the recipe. I have just moved from the “I hope this works” category to the “I am a genius” category when it comes to the ultimate chocolate chip cookie. THANK YOU! I will no longer search for a CCC recipe. I made a couple preference tweaks, but I don’t think they impact the result in the overall result. I like using coconut palm sugar (used a blend of white, brown and cps) and I also subbed in a little oat flour. Again, these are my preferences. Cooling the dough as I type this. I’ve never browned butter before– I have been missing out! Question, is it normal that my dough was super tough to mix. I’m talking play dough texture.. thanks! The dough usually isn’t super tough to mix (just be sure to scrape all of the butter), but so glad they worked out! Can I use coconut sugar in place of brown sugar? I prefer it but not sure how they will turn out. Coconut sugar should work well! Just made a triple batch for an event at my child’s school.. tried about 7 you know just to make sure haha.. this is by far the best thing I have ever baked in my existence! Thank you up and down for this recipe! These are truly the best! I can’t wait to try more of your recipes you definitely have a new fan girl over here!!!!! Amazing!! So happy to hear that 🙂 These are my #1 fav cookies. Hope you find some more recipes that you love! Hi Monique, thanks for a FANTASTIC recipe. My question has to do with measuring the packed brown sugar. I firmly packed it and it turned out great but if I wanted to weigh it how many grams would it be…200? Thanks again!!!!!!! Hi Greg! Glad you love this one! I think 1 1/2 cups of packed brown sugar is a little over 300 grams. I’m not sure if it was the bit of yogurt, or actually chilling the dough for 24 hours, but not only do these cookies taste great, they LOOK exactly like a chocolate chip cookie is supposed to look! Thick and chewy with decadent cracks and crevices, and free from the horrible thinning suffered by so many chocolate chip cookies. I am a fan! All of the above! So glad you loved these ones! Do they freeze well after baking? I’ve made them to early & afraid they’ll all be gone by Christmas Eve! I haven’t tried it but they should! These cookies were seriously the best I’ve ever had! I will never go back to another chocolate chip recipe again. I also froze the raw cookie dough and bake them for 20 minutes and they turned out just as good as fresh! So happy to hear that! I love freezing the dough, too. 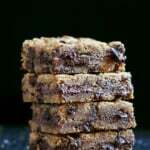 i have been making these cookies for a few years now + every time i share them with friends/family they receive rave reviews! i just recently discovered hersey’s kitchen sea salt caramel chips + have started using half of those/half dark chocolate chips, best flavor profile yet! had a coworker give me $20 to make a batch for him – which speaks volumes as to just how amazing this recipe is. Literally the best cookies ever. These are my go-to cookies to take to parties/dinners! I followed the recipe, but my dough came out crumbly instead of cohesive. I can form a very delicate ball of dough, but the consistency is different from a normal cookie dough recipe. Should I add more butter/liquids? I have the dough chilling overnight. Hi! Sounds like some of the moisture of the dough may have escaped. Did you scrape all of the butter into the pan. Make sure you thaw dough to room temp first, then roll into balls. They should bake up fine! I made these for my husband for Valentine’s Day and he loved them! Might be his new favorite cookie recipe! These cookies are definitely my new go to chocolate chip cookies for every occasion. I browned my butter in the microwave (don’t forget to put parchment paper over the bowl…butter spits) and after 7 minutes, it was perfect. Just a great recipe! Hi Monique! This is totally the best chocolate chip cookie I ever had – ever! Just wanted to ask as my cookies are a bit greasy, is there any way I can fix that? And also, I wanted to lessen the sweetness just a little bit, would you recommend to lessen the white or brown sugar? I do hope to hear from you!! You are wonderful! I am so inlove with this recipe! Hi Monique! This is such an amazing recipe!! I love it so much! Such a big hit! I just wanted to reduce the sweetness a little bit, it is definitely not too sweet but I personally like it a little less sweeter – do you recommend to reduce the brown sugar or white sugar? Hope to hear from you! Hi! I would suggest reducing the brown sugar by 1/4 cup, although be warned — the cookie consistency might change a bit. These are hands down the BEST cookies I have ever tasted! I make them regularly for my co-workers and they DEVOUR them! The slightly longer process to brown the butter and then thoroughly chill the dough are totally worth the wait! Make these – NOW!! !